UPDATE: The winner is domestic diva [email protected] Congratulations! A few months ago we experimented with taking dairy out of my daughter’s diet to see if that was the cause of her extreme constipation and lack of weight gain. Sure enough, when we removed all dairy from her diet, both of those problems cleared up. In January my 2.5 year old only weighed 24 pounds. Now, in April, she is up to 26 pounds. For the most part, the transition to a dairy free diet has been fairly easy for her. She feels so much better, even when others are eating her old favorite, macaroni and cheese, she has no trouble resisting. I have been dairy free myself since last August, so I had a great deal of knowledge of what she could and could not eat. If I did not have this knowledge, transitioning her might have been difficult, especially during holidays like Easter. However, I had the opportunity to review Go Max Go vegan candy bars (see my full review here), so I know first hand that they are delicious. If they weren’t marked as dairy free, I never would have believed it. They are as tasty (I think even tastier) than regular candy bars. This year, my son, who is not dairy free, and my daughter both will be receiving Go Max Go candy bars in their Easter baskets. They won’t be disappointed! 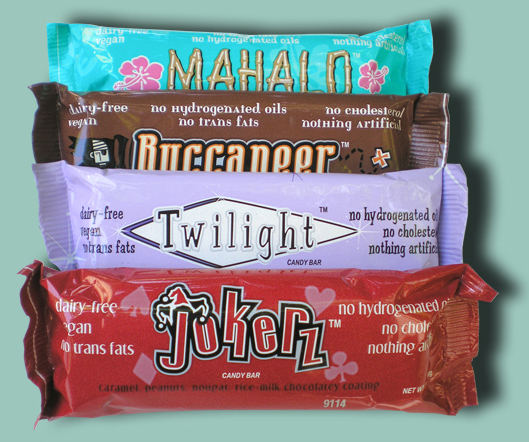 Go Max Go Foods has graciously agreed to give one lucky winner a sample pack of the four candy bars pictured above. To enter, either go to the Go Max Go Foods site and leave a comment here tell me one thing you learned OR leave a comment telling me how you typically find out about new products on the market. This giveaway will end on April 25, 2011 at 11:59 p.m. The winner will be chosen via random.org. Please note–These bars are great for people who are dairy intolerant but not necessarily dairy allergic because they are manufactured in a shared facility that does process dairy items. Go Max Go bars are manufactured on dedicated days that dairy is not used. However, there is the possibility of cross contamination as equipment is shared. Experimenting with my own daughter’s intolerances is how I find out about new products. We have also dealt with low weight gain and funky poo habits. We are still experimenting and learning as we go, but hopefully our next dr. appointment will yield good news for her weight (we weren’t even at 20lbs at her 15mth- not even big enough to be front facing in the car yet!). Thanks for an awesome giveaway! I learned that Go Max Go is adding two new flavors to their entirely cruelty-free line of candy bars! I like Go Max Go Foods on Twitter @adthomas. I typically find out about new products on the market via the internet (blogs, mostly), magazines, and word-of-mouth. I follow your blog via RSS feed. I would love to win the candy bars! I usually find out about new products on the market by following so many blogs. I typically find out about new products through the coupon section in the Sunday paper. I learn about new products through the internet – mostly couponing blogs, bzzagent and house party sites. I always find out about new stuff from my vegan friends! They’ve actually told be about the buccaneer bars but I haven’t tried them. I usually find out about new products on the market through coupon offers or magazine ads. Interesting, and these seem to be good, healthy choices. Vegan and dairly free, yet maybe tasting better than regular candy bars, seems like a pretty good deal! I find new products by looking in the store and by running across them in the internet–like here. Never heard of these bars before. I learned that they are coming out with peanut butter cups as one of their two new offerings. YUM! PEanut butter cups are my FAVORITE! Thanks so much for the AWESOME giveaway!!! Vegans unite! I learned that they are coming out with peanut butter cups!! I learned about palm oil production issues. I learn about new products mostly my word of mouth and advertisements. I typically find out if a new product is on the market by seeing it in a store, sampling it, or reading about it on a blog. I like Mom’s plans on Facebook. I have found blogs are a great way to learn about new products. I have pruchased several new products this way. I am a dairy allergic ADULT (and no, I’m not lactose-intolerant). I appreciate companies who can help those of us out so we can have treats TOO! Additionally – I do appreciate the promotion of sustainability, fair labor and environmental stewardship. I went to their website, and found out where to buy them in my area. I’m always on the look out for vegan products, and I’m a little surprised I hadn’t heard of them yet. Though it makes sense, as they aren’t at the usual stores I shop at! That goes along with your other question–I generally notice new products by seeing them at the store, or otherwise through ads/word of mouth. I found out these bars are vegan ! I learned that food that is good for you can look good. Hopefully, I win so I can see if it tastes good too! I learned that they use rice milk and palm oil to make them instead of soy milk and soybean oil! I find out about new products by reading blogs like this one! I find out about new products on the market by perusing food blog and “green” blog and also using search engines with key words. I have a lactose intolerant child so am always on the look out for new items that are honestly reviewed which is why I appreciate blogs. There are several sites I use to find out the latest products available- Start Sampling is good, Kraft First Taste and Walmart’s new products webpages are informative also. I am dairy intolerant and I am always searching for chocolate that is safe for me to eat. It’s a challenge! I found out that these chocolate bars are on the safe list and from the looks of it they seem like they taste good too! I use several blogs about dairy free food to help me find new products on the market and I am pleased that I found your blog! I learned that there’s a few local grocers (Fresh Markets and Whole Foods) where I can buy Go Max Go candy bars. Mandatory – I learned that they use rice milk– that’s a neat idea! I find out about new products by receiving free samples and being on companies’ mailing lists. I typically find out about new products by going to festivals/shows in which new products are often showcased. I recently found about a tasty butter substitute this way! I follow Mom’s Plans via GFC! I learned about the origin of the Go Max Go day! I learned they are adding 2 new flavors, peanut butter cups and crisped rice bars. I findout through commercials or just y seeing them in the store. I learn about new products mostly by reviews on blogs! Blogs are my favorite way to discover new items on the market. Like Mom’s Plans on FB as kyhere here. Following Momsplans on twitter as ky2here1. Following GoMaxGoFoods on twitter as ky2here1. When I see new things at the market I’ll frequently try them (assuming they’re the sort of thing we eat). I also get referrals from friends. i get most of my product info from bloggers like you. I usually find out about new products through surveys I take or through following blogs. I learned that they have TWO NEW FLAVORS COMING SOON, yum! Max was a pound puppy! I learned that the name of the company is a tribute to their dog. I have to eat dairy free while nursing… First time dealing with this so I’ve been getting info everywhere I can! I’m following Go Max Foods on Twitter. I typically find out about new products on the market by scanning the grocery store shelves and keeping up with blogs. Following Max on Twitter (pricelessteam).